The Erlanger Southeast Regional Stroke Center is one of the largest stroke centers in the nation, and it is also one of the most accomplished. As this region’s first and only Comprehensive Stroke Center as certified by the Joint Commission, the Erlanger Regional Stroke Center is able to significantly improve outcomes for stroke patients by offering more treatment options and by adhering to high national standards and guidelines. Our outcomes also reflect leadership and clinical innovation that’s getting global attention. At the 2015 International Stroke Conference, the Southeast Regional Stroke Center was recognized for leading worldwide clinical research that proved interventional stroke care – the type of care provided exclusively in this region by Erlanger – is definitively the new standard of care for stroke. 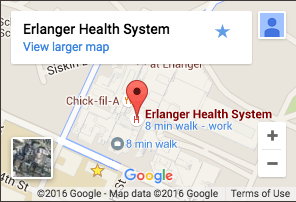 Of all participating hospitals in the worldwide clinical trial, Erlanger achieved the best overall outcomes and the fastest treatment times. Erlanger’s Southeast Regional Stroke Center has been awarded the Comprehensive Stroke Center Certification by The Joint Commission and the American Heart Association/American Stroke Association. This certification recognizes hospitals offering the highest level of care for those with the most severe and challenging types of strokes and cerebrovascular disease. Health care systems awarded the Comprehensive Stroke Center Certification are recognized for having state-of-the-art infrastructure, staff and training to receive and treat patients with acute to the most complex stroke cases. To achieve this certification, Erlanger’s stroke center team underwent a rigorous onsite review. The Joint Commission surveyors reviewed Erlanger’s compliance with the Comprehensive Stroke Center standards and requirements, including advanced imaging capabilities, 24/7 availability of specialized treatments and staff with the unique education and competencies to care for complex stroke patients. Erlanger is dedicated to improving the quality of stroke care and the American Heart Association/American Stroke Association’s Get With The Guidelines program helps us achieve that goal. 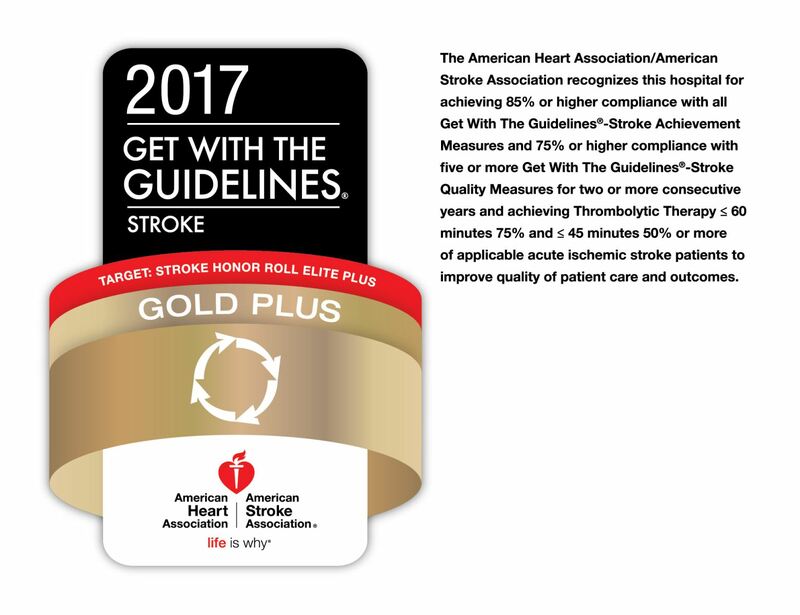 Hospitals receiving Get With The Guidelines Gold Plus Achievement Award have reached an aggressive goal of treating stroke patients with 85 percent or higher compliance to core standard levels of care as outlined by the American Heart Association/American Stroke Association for 24 consecutive months. In addition, those hospitals have demonstrated 75 percent compliance to seven out of ten stroke quality measures during the 12-month period. Hospitals achieving Time to Intravenous Thrombolytic Therapy ≤ 60 minutes in 75 percent or more of applicable acute ischemic stroke patients treated with IV tPA AND door-to-needle time Time to Intravenous Thrombolytic Therapy within 45 minutes in 50 percent of applicable acute ischemic stroke patients treated with IV tPA to improve quality of patient care and outcomes. With the help of LifeForce air ambulance the Southeast Regional Stroke Center serves patients in a 5,500-mile area.